I am not yet sure how many parts this is going to be, so I am just going with this as part one, and we shall see how many parts I end up with! So the most amazing running time ever started very early on Friday morning. I left my house around 4:45 am to meet my team in the parking lot at the Florence Mall. 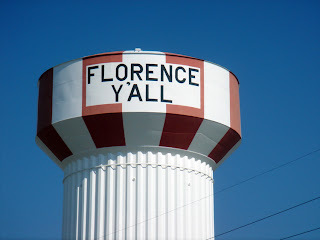 That is where we decided to meet as it was fairly central (one of our teammates lived in Northern KY) and it was after 71 & 75 join together to head south into KY.
Yep, this is the watertower in the parking lot at the Florence Mall. It apparently used to say Florence Mall, but that was advertising and not ok, or something. But now it is my coming from the south, getting close to home landmark. All of van 1 made it to the mall and we loaded up our gigantic white van with a ton of food and all of us. 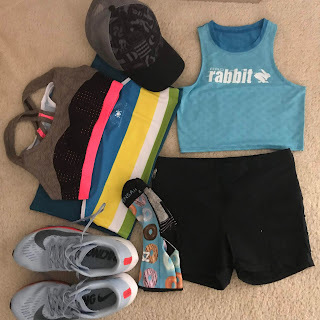 The majority of us were already dressed in our running clothes for our first legs, plus hoodies or jackets since it was a little chilly and it appeared to be threatening rain. 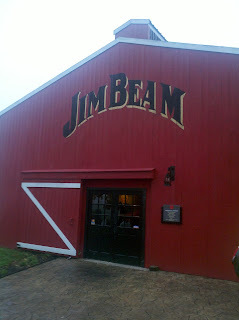 Once we were all loaded in, we took off for Clermont, KY where Jim Beam is located. 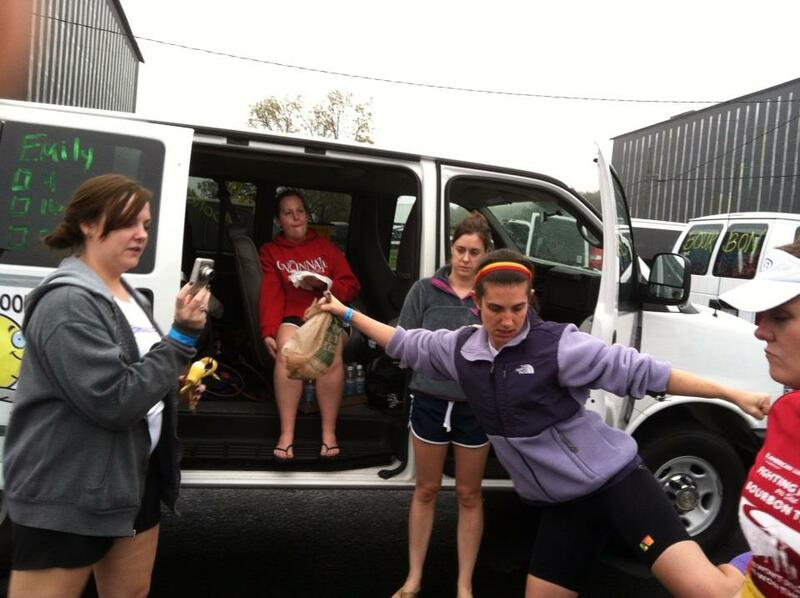 The first runner in our van, Sarah, was starting from here. We had a scheduled 10:30 am start time (they have a staggered start based on estimated paces) and we were planning on being down there around 8:30 am to get checked in, decorate our van, watch some earlier teams start the race, etc. Not to mention have an early morning bourbon jolt to get us going! 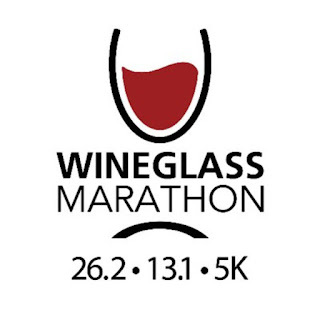 The deal with the tasting is that everyone was allowed to have the 1/2 oz sample whether you were driving or running. That was allowed no matter what. And we were looking forward to Jim Beam. So the above was the set up for the tastings at Beam. 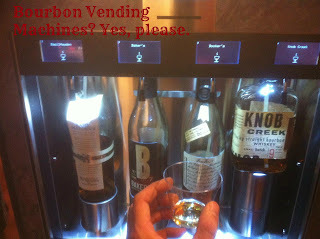 They had multiple machines with different sorts of Bourbon (did you know that Red Stag is a Beam product?) and you had received a bracelet at check in. 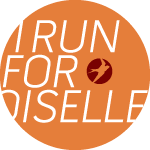 This bracelet was kind of your token for all of the tastings throughout the race. At Beam, you go into their tasting room and show them your bracelet. They put an x on your hand with a sharpie (to show that you have already had a taste, I suppose) and then give you a plastic card (like a debit card, I guess!) The card is loaded with two tastings. You insert the card into the slot in the above picture, and push the button for the bourbon that you want to taste, and it dispenses into your cup (hold your cup under the dispenser!) your perfectly poured sample! I tried the Jim Beam Black, and the Honey tea. That'll wake you up before 9 am! It stopped raining for a little bit, and we were able to get our van decorated. We also started working on a few of the challenges that the Bourbon Chase set up for the race. Like taking an outrageous team photo. 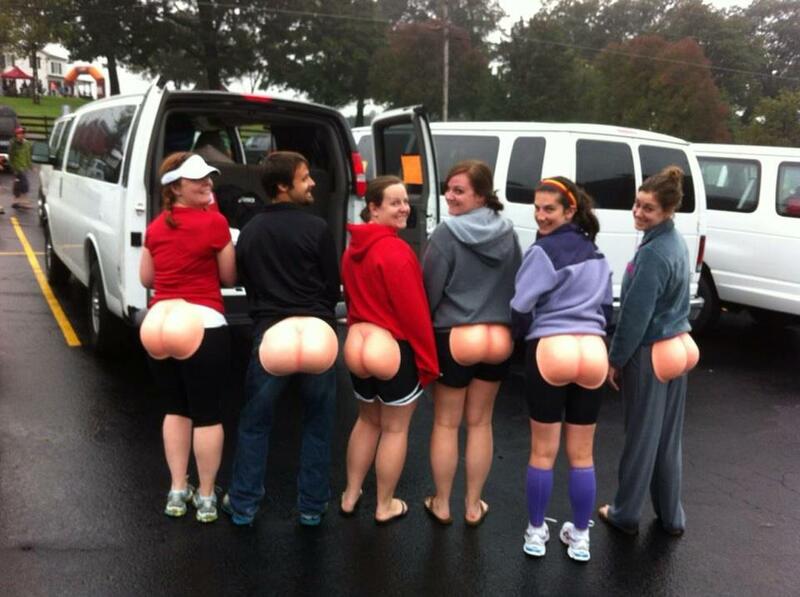 Our team was called the "Full Mooners", hence the butts. Some folks actually wore them while running. I, in true party pooper form, did not wear one except in that picture. However, I did wear some particularly excellent outfits (see my compression sleeves above) and a lot of spandex. Sarah took off for her first leg after it started raining again (ugh) and the rest of us piled in the van to head off to the first exchange point. She had 7.1 miles and when we arrived there, we were kind of starting to wonder what we were going to do in the van during this time. We talked about "oh, should've brought a book/kindle/games..." Little did we know... 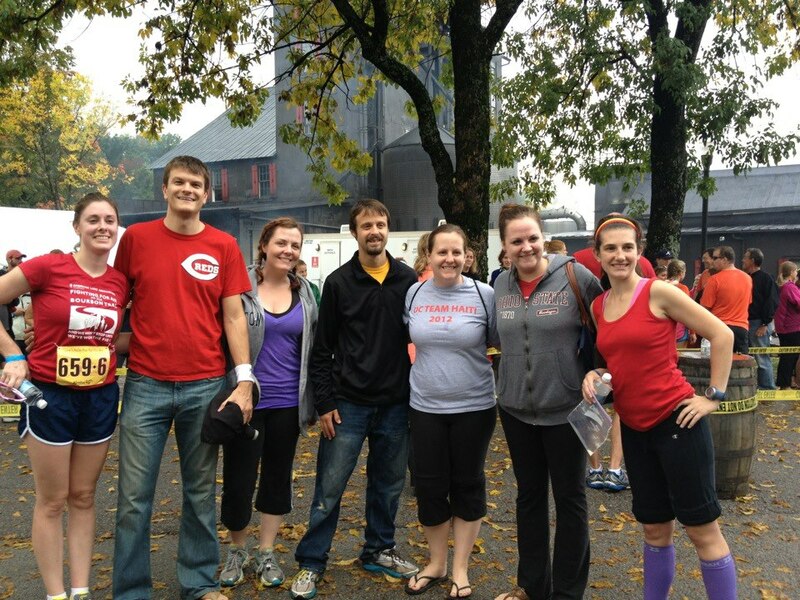 The rain started to slow, lucky for our runners, and we had a few exchanges. 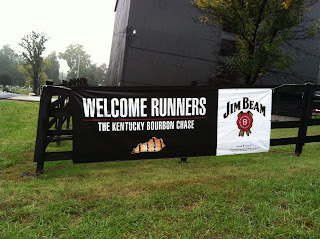 My first leg was to start at the Heaven Hill Distillery. 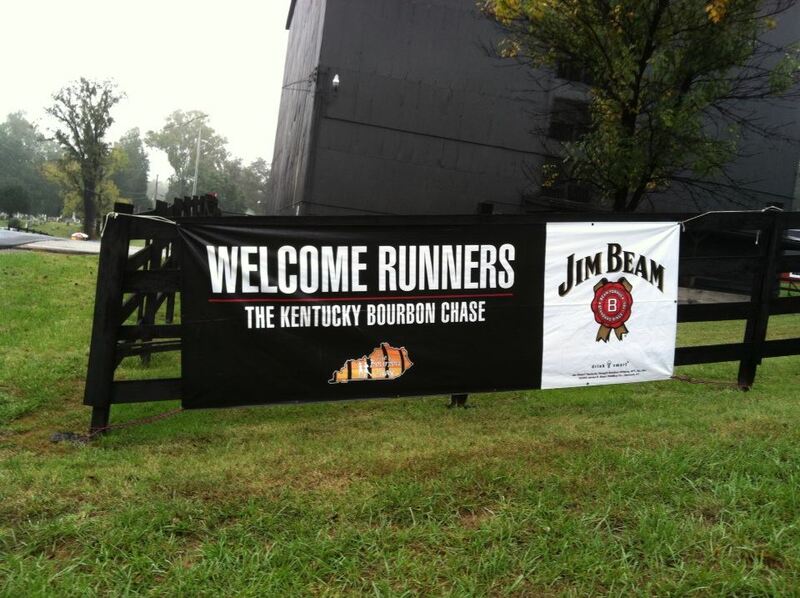 I had not heard of Heaven Hill before this race! I was scheduled for 5.2 hilly miles. I had the longest and most difficult legs of the race. I had 19.3 miles on the schedule and all of them were ranked "D" for difficult. Plus in the order ranking, I had 1 and 1 for both length and difficulty. I was kind of psyched up about it, and feeling kind of badass. Yes, my leg was called "Little Pottershop of Horrors". And check out those hills! Omg. Apparently a lot of the speedy male runners (there were VERY few females as runner 4 this race, I am nearly certain!) charged up that last red hill and puked after coming through the exchange. I had enough left that I was able to charge up the hill and NOT puke. I will take that as a win. Our last two runners, Andrew and Jen, ran their legs after me. 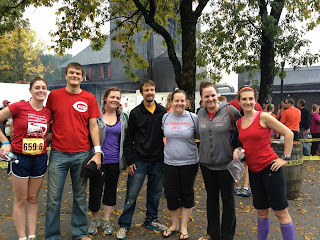 Jen's leg ended at Maker's Mark, and that is where we would meet up with Van 2 for the first time. They did not go to the start, and I think they were disappointed to not get to go to Beam, but they did have a decent amount of time to hang out at Maker's before we got there. It was a HUGE festival of white 12-man vans parked there since ALL of the vans were meeting there. Here is our team after we finished our first legs. We were still feeling pretty good at this point! Another super classy Emily outfit. Rolled up yoga pants (in my defense, the ground was pretty wet), my sleeves - purple matches everything, obviously, and a tank with the garmin. The guy in the reds shirt was our driver, and his name is Ben. 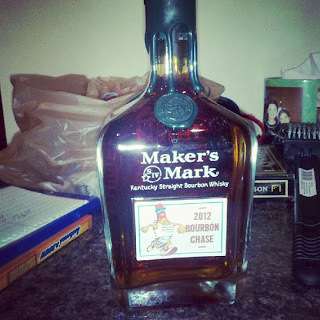 In the special Bourbon Chase bottle. The butts are hilarious! I love that they named the run legs, that's cool.